The garden is calling. 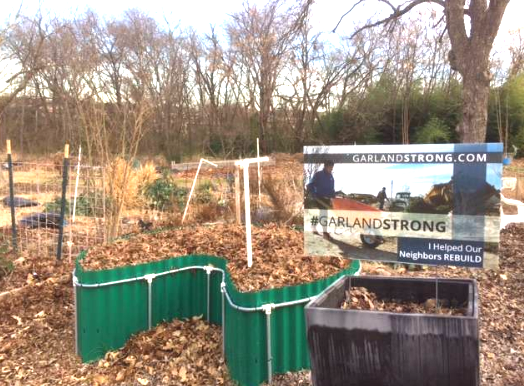 Hard to believe, but there is a lot of work to be done in the Garland Community Garden—even in the wintertime. Tuesday I cleaned out one bed that has blackberry vines. Yesterday I devoted 3 hours to distributing leaves that had been left over the past week. The great thing about being in the garden is that it provides the necessary quietness to grow a large peaceful space in the mind for thinking about things one might not otherwise ever take time to consider. People continue to bring leaves to the garden and I’m glad because it tells me they are aware and that they care. I wonder how many people have taken leaf awareness a step further and are keeping their leaves for composting into soil. I'm sure there are more than a few who have taken leaf awareness this step further. It’s such a simple act and yet such an important one for the future of soil—a critical element for the ongoing environmental health of our community. Soil doesn't just come out of nowhere. It's created from decaying organic matter such as leaves. Removing leaves is removing future soil. I’m hoping that Loving Garland Green can take leaf awareness a step further this coming year and work with the Garland Environmental Services and perhaps Keep Garland Beautiful to 1) Find a way to get large paper bags to garland residents for leaf recycling next fall 2) Educate residents to only put leaves in the paper bags. [Based on over 1000 bags now that I’ve opened, Garland residents don’t need much education in this area. Thus far only four bags contained anything other than leaves.] 3) Have Garland Environmental Services pick up the paper bags of leaves along with the shrub trimmings and branches. No labor would be required for emptying the paper bags as they could be mulched with the leaves and residents could pick up the compost and mulch free at the landfill. The world is filled with nameless people such as those dropping off leaves who do good deeds. Once in a while we hear about these ordinary heroes, but the overwhelming nameless number of them remain unheralded and unknown. The world is filled with far more heroes than assassins, far more angels than demons, far more saints than sinners. There are far more “ordinary” people making the world a better place than evil ones trying to undo it. Open your eyes and look for them and you will see what I mean. To listen to the news and to read some of the emails we get, one would think we are on the brink of the apocalypse with the Four Horsemen and their riders –Conquest, War, Famine and Death-- already sighted just around the corner. However, the peace, order and continuity of the garden reassure me that the beautiful life is still out there. The more we make efforts to support and grow this beauty, the better we all will be. The garden is also a great place for lessons in humility. It reminds me of our majestic planet and how little we actually know about it. I thought about that yesterday as I was digging the grass out of a bed and contemplated the fiery heart of the earth. More than three thousand miles below us is the core of the earth. Scientists know very little about it. But we think that seismic waves have taught us a few things. We think we know it has a liquid outer core and a solid inner core. We think we know that the convection currents in the outer core dictate our magnetic fields. We think we know the inner core is solid iron. Its temperature hovers at around 5,000 to 6,000 degrees Celsius. But again all these “facts” are nothing more than educated guesses based on secondary effects that have been observed. To date we don’t have the technology to bore three thousand miles down to the center of the earth. We can accurately determine that it’s three thousand miles to the center by using basic math as the earth’s circumference is measurable and is known. To this day, the deepest humankind has ever gone is just 7.6 miles below our feet — or just 0.2% of the distance to the Earth’s core. This was accomplished by a project titled The Kola Superdeep Borehole. It took the people working on this project 19 years (1970 to 1989) to drill 7.62 miles. Drilling had to cease when temperatures reached 180 degrees Celsius. The Russians undertook this experiment that was finally scrapped in 2006 due to lack of funding. A couple of longer borehole lengths have since been established. However in terms of depth below the surface the Kola Superdeep Borehole retains the world record. We really know very little about anything that matters and yet how many of us don’t even bother to question what we read or hear. With hardly a pause we indignantly postulate unsubstantiated hearsay and myth as fact and pass it on. The garden has countless lessons for those who take the time to stop, work, look and listen. No, you won’t get all the answers, but you will have peace in your heart that good prevails in spite of all appearances to the contrary. One thing is for certain: We take care of the things and people we love and love grows all things—even gardens. At our first meeting on January 3, 2017, I will be passing the torch for the leadership of Loving Garland Green over to Jane Stroud. The only tiny regret I have about my dedication and involvement in Loving Garland Green is that I will lose my certification as a Dallas County Master Gardener this year. There are only so many hours in a day. This year has been a particularly busy year for me as I was also out of town for the month of August helping out a friend in California who broke her arm. In order to maintain certification with the Master Gardeners, one has to document 70 hours of community service working in gardens that are approved and certified by Master Gardeners. One of the funniest assumptions that people make about me is that I’ve been gardening all my life. The truth is that I planted my first garden in my life in June of 2013. Just about all I’ve learned about gardening has been from that experience and from the Master Gardeners. Mayor Athas told Loving Garland Green in October of 2013 that we could have the parcel of land located at 4055 Naaman School Road—an approximated 3 acres. But as it turned out there was a difference of opinion within the Neighborhood Vitality office and the Parks and Recreation Department as to whether this land should be used for a community garden. As with most differences of opinion among civilized folk, a compromise was extracted and Loving Garland Green ended up with about three-fourths of an acre to steward. We are grateful for this and I feel that we have made the most of this great opportunity to grow and learn about urban farming with our community. We’ve come a long way in less than three years. Since the installation of our first bed down at the garden on April 14, 2014, the garden is now growing over 1,000 plants each year and many of these plants are perennials that will return year after year. Some of these plants include 25 blackberry bushes; three pear trees, two peach trees; one apricot tree, one pomegranate tree; a two-year old grape vine with four strong plants; and one jujube tree; three lavender bushes; three Mexican Tarragon plants; three huge beds of mint; four large bushes of lemon grass. In addition to these edibles, we also have many clumps of native grasses throughout the garden and a large pollinator garden filled with native perennials such as lantana, Turk’s cap, native milkweed, many varieties of Salvia and more. The Garland Community Garden, an organic garden, is a living example illustrating many of the various urban gardening formats and methods available to an urban resident: square foot gardening; lasagna beds; container gardens; spiral herb garden; several hugelkulturs; and keyhole garden. Features in the garden include a Medicine Wheel which is a small version of the ones built by Native Americans that dotted the landscapes of North America for hundreds of years before the Europeans arrived; a loofah tunnel built by one of our founding members, Charles Bevilacqua; our spiral herb garden built by Margie Rodgers and Marie Mathis (the spiral garden is an ancient permaculture structure that was introduced to the world by monks during the Middle Ages); a children’s garden with a puddling pool built by member Cheryl Andres; a Blackland Prairie plot featuring native grasses; and of course our pollinator garden. Over the past two and a half years we have done a lot of work with the students in the Garland ISD: We’ve taught a six weeks botany election for students at Beaver Tech; we donated and helped to install a pollinator garden at North Garland High School; we hosted 100 Watson Tech students on a two hour tour of the Garland Community Garden; we assisted the students at Watson in building a hugelkultur (a type of garden bed that is great for areas such as ours that are prone to drought); we’ve donated two olive trees, one orange tree and one lemon tree to the Watson greenhouse (both citrus trees had fruit on them); and we’ve held classes down at the garden for home scholars on topics such as the importance of our native bees. 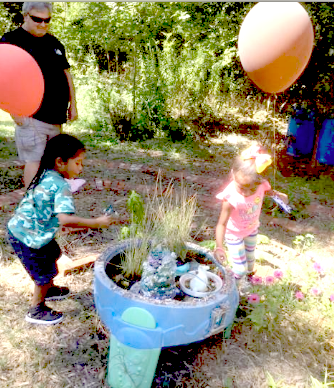 In addition to these activities, we have participated in many community educational events such as health fairs—and we’ve supported other nonprofit organizations as well such as The Good Samaritans and Keep Garland Beautiful. Loving Garland Green has been very active these past two years in raising public awareness regarding the importance of pollinators. In addition to assisting schools in planting pollinator gardens, our members have been very active in rescuing Monarch caterpillars, tagging and releasing them. To day over the past two years we have successfully rescued and released about fifty Monarch butterflies. As for our native bees, we have six homes for them down at the Garland Community Garden. As for the European honeybee, another important pollinator, we have a hive of them down at the garden as well. One of our latest ventures into public awareness campaigns for reducing our community eco-footprint was our recent 2016 November Leaf Awareness Campaign. The goal of this campaign was to first get the word out to residents of Garland that the leaves they put curbside in plastic bags go to the local landfill. This is not a good thing, but we found that just about everyone we asked mistakenly believed these leaves were recycled. We collected leaves from the Firewheel area over the month of November and collected over 600 bags. In addition, residents left bags of leaves down at the garden. Thus far into December we have 1,008 bags of leaves that have been deposited at the garden. This, of course, is an infinitesimal amount compared to the bags of leaves still being taken to the landfill (estimated at about 800,000 bags). We are happy to report that citizens continue to bring these leaf bags to the garden. Ideally leaves should remain where they fall to help rebuild the soil as they contain nutrients and minerals needed to not only replenish but also to make new soil. Soil (and particularly urban soil) is an endangered resource. We think that Garland’s solution to the leaf issue might be simple: 1) Educate people to only put leaves (no trash such as plastic bottles) into large paper sacks curbside—or to compost at least some of these leaves in their own yards. 2) The city could pick up these paper bags of leaves just as they pick up the leaves in the plastic bags. Instead of taking them to the landfill, they could process these leaves with the trash and shrubbery trimmings they now pick up and mulch. The resulting compost could be shared with Garland residents. Donate $12 to Loving Garland Green and receive a one-pound bag of native pecans. If you live in Garland, Call 972-571-4497 for Delivery. 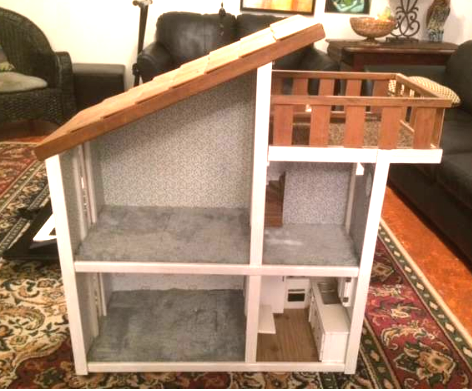 Donate $35 to Loving Garland Green and receive a three foot by 3 foot by 18 inches deep doll house furnished with Barbie furniture. (Furniture includes dining room table with turkey, outdoor grill and picnic table, bedroom set and more. Call 972-571-4497 to see if it's still available. 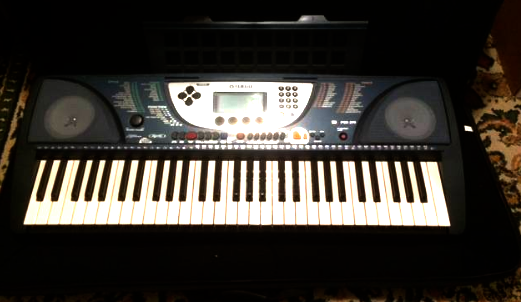 Donate $125 to Loving Garland Green and receive Yamaha Grand piano keyboard like new with case, stand, pedal and necessary cords. I've been going through some of the donations for the upcoming Loving Garland Green end-of-the-year holiday yard sale tomorrow and the things I've seen! Perhaps our most outstanding item for uniqueness, if not practicality is a wine cooler made by Philips. It is brand new, still in the pristine box complete with instructions. 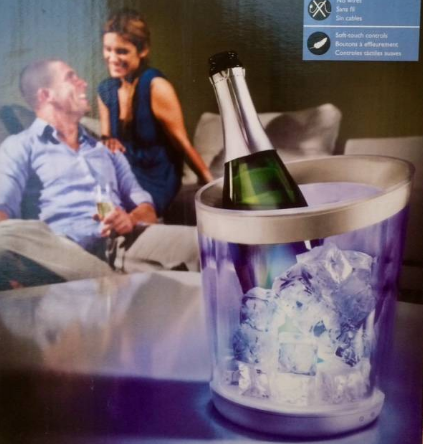 This wine cooler bucket flashes colors, has adjustable brightness, comes with a recharger base. This item retails for $200 and Loving Garland Green has it listed on Craigslist for a mere $40. If you have someone on your list who has almost everything, this may be the gift for them. Been wondering how to be more chic? Wonder no more! Call 972-571-4497 and purchase this Philips Cooler while you can! $200 value only $40! This bottle cooler gets 5 stars based on it's quality, innovation and form. The cooler keeps wine chilled, and the ice in the bucket doesn't leave much or any condensation around the bucket. I didn't notice any sweating on the outside of the bucket, and even though the inside of the bucket was cold, the bucket itself on the outside was not too chilly to pick up. It's double insulated, and does a great job of keeping everything cold. When you first receive it, you have to charge it up for 12 hours to get the battery fully charged and it can work for up to 10 hours on a single charge. It charges via wall outlet, and you simply place the bucket on the charging base. Nothing to snap in or connect, just set it and forget it on the stand to charge. You can use it while it is plugged in also. The controls are flush with the bucket, and you simply put your finger on the controls to choose your settings. Hand washing is recommend, and it CANNOT go in the dishwasher!!! It's nice to have on the deck out in nice weather. I had it giving off a nice romantic light out back, while illuminating the wine and ice cubes. It has a center white LED to illuminate your wine, and multiple brightness settings. You can also set the white led to pulsate, or stay steady. You can also shut off the white middle LED if you choose. It also has 8 colored LEDS which can create a ton of other colors. You can also adjust the speed in which you want the color LEDs to change, or stop it at a particular color if you want. The LEDs barely emit any heat so no worries about the lights melting the ice cubes. This is one impressive "ice bucket". Philips is the leader in these lighting style home products and most will complain about the price, but the technology is not cheap. This is definitely a "luxury" item, and if you have about $200 sitting around not knowing what to do with it, I would suggest you pick this up. The device does what it is supposed to do. It is elegantly shaped, and executed well. My favorite part about the device is the long battery life and the ease of charging. Full disclosure, I received this from Amazon Vine, but if I had to pay $200 for it, I probably would not consider it. I give it 5 stars because it does everything it says it does, and has no flaws to me. Pricing is not considered a "flaw" in my opinion (since I am rating the product itself, and not the feasibility of the item), and did not affect my rating of the item. I absolutely love it though and it is a great conversation piece, especially at parties. Not too many people you know in life will have one of these in their homes. It is an exclusive item to own. I just checked on EBay and saw where the exact model (also used) sold for $179. and that model said that it showed wear. This one is in like new condition. The $125 price is firm. WE HOPE YOU WILL COME TO OUR GIANT YARD SALE FOR CHARITY TOMORROW AND PICK OUT YOUR OWN FAVORITES! You don't have to rise at the crack of dawn as we absolutely will not begin selling until 11AM so you early birds can have plenty to time to go to other sales before stopping by 211 Kingsbridge Drive Garland Texas 75040. Those who come to the sale will also have the opportunity to make a $12 donation to Loving Garland Green and receive a one-pound package of locally picked native pecans. 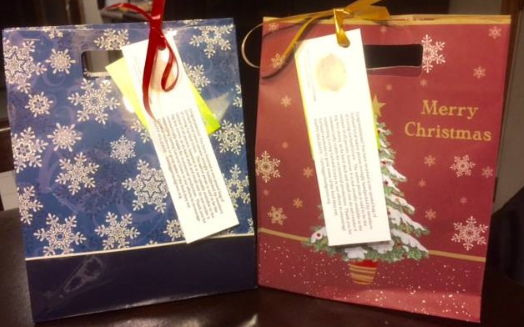 Get rewarded for supporting a great nonprofit and receive holiday gift that you can pass forward or use yourself. DONATE $12 TO LOVING GARLAND GREEN AND RECEIVE A FREE One- Pound BAG OF NATIVE PECANS! What charity do you know who will give you a pound of native pecans in return for a $12 donation to their organization? Loving Garland Green members picked these native pecans locally within the last two months. They were cracked locally. And members of Loving Garland Green, a local nonprofit, cleaned and bagged them. Native pecans are not often found in stores—other than a few specialty shops where they can cost up to $25 pound this year. 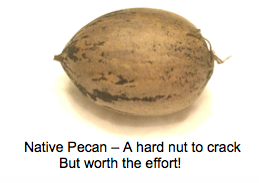 Not many of them are sold commercially because processing and the resulting yields from the effort erode profit margins: The shell of the native pecan is very tough to crack and the pecans are small. Thus it takes many pecans and a lot of labor to make a pound of them. On the plus side for the native pecans, they are said by most to have the best flavor of all pecans—including the larger paper shell hybrids--some of which can be tasteless. Bigger is not always better when it comes to pecans. In addition to having a pound of native pecans, you will also be supporting an organization in raising local community awareness of the importance of growing some of the food they eat and in being more eco-friendly. Loving Garland Green is the official steward of the Garland Community Garden at 4055 Naaman School Road in Garland Texas. Their mission is to help make their community more food secure by encouraging residents to grow at least some of the food they eat. This organization works year-round with students (home-schooled and Garland ISD): They present classes on topics such as the importance of pollinators and native bees; they rescue monarch caterpillars and then tag and release them; they raise public awareness on the importance of becoming more eco-friendly; they help residents and students build gardens; they donate plants and trees to local school gardens; and more. Donate $12 to Loving Garland Green during the months of December and January, help support your local community AND get a bag of native pecans. Call 972-571-4497 to reserve your bag today. Delivery is free in Garland. Others can pick up their bags at the Garland Community Garden on Sunday afternoons 2PM to 4PM. 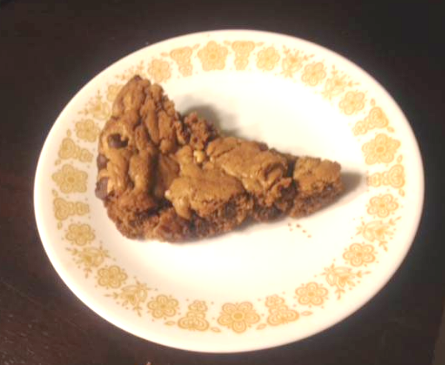 This chocolate chip cookie is made in an iron skillet and more resembles a chewy brownie than a cookie. Is there a Healthy Chocolate Chip Cookie? Maybe there are healthy chocolate chip cookies out there—at least healthier and easier to make than the traditional toll house variety. I tried this recipe yesterday from Donna Schwenk's "Cultured for Life" recipes. It's probably not going to win over any hard-core toll house fans as it is a tad on the unsweet side, but I like it and the second piece is better than the first. What to do on a rainy day? Try out new recipes. This one is made in a iron skillet—no bowl to clean up—just stir and bake. The following recipe makes one 8-inch cookie—8 to 10 servings. Slice the cookie like a pie. Melt the butter in an 8-inch cast-iron skillet over medium-low heat. Stir in the Sucanat (or organic sugar) and vanilla. Remove the pan from the heat and let it stand until it is just warm, about 5 minutes. Crack the egg onto the butter mixture, and use a fork to combine. Add the flour, baking soda, and salt, and stir carefully until the mixture is smooth. Add the chocolate chips and stir until evenly distributed throughout the dough. Note on my introduction to "One Degree Organic Foods"--the organic sprouted Spelt Flour I used to make these chocolate chip brownies. One degree (of separation) farmers are proud to stand behind their harvests. That's why you'll see their photos right on their packaging. But that's just the first step. You can scan their QR code to make an extraordinary level of transparency come alive. Or you can go to onedegreeorganics.com and enter the six digit code K9D8RD. Very interesting. What to do with the rest of this cloudy Day? Make some ginger soda starter! According to many sources, ginger is a great help in dealing with high blood sugars, muscle cramps, nausea, asthma and hay fever. Ginger is considered stronger than a non-steroidal anti-inflammatory drug (NSAID). In 2004 Biological and Pharmaceutical Bulletin reported that ginger can suppress cortisol production. High levels of cortisol can increase belly fat and contribute to weight gain. In 2014 the International Journal of Food Science and Nutrition reported that ginger taken daily for eight weeks reduced insulin sensitivity and fasting blood sugar levels in Type 2 diabetics. 5. When ready to use again, feed and wait 24 hours for bubbles to return. 6. After using your starter to make ginger soda, add a cup of water to your starter mix. 3. In a 32 ounce bottle add sugar water and ginger starter. 4. Top off with extra water leaving one-inch space from top of bottle. 9. Store in refrigerator for up to a week. The Only Compost Christmas Tree in the World: THE GARLAND TEXAS COMPOST CHRISTMAS TREE. 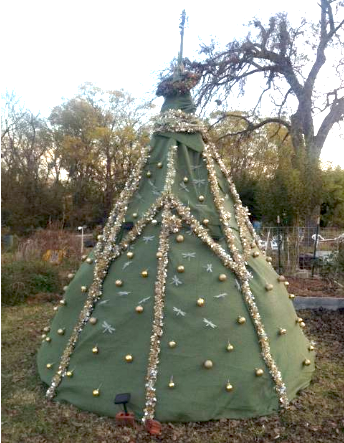 You must come to the Garland Community Garden to see the world’s only compost Christmas tree. This tree is about three-quarters filled with leaves. By the end of December it will be completely filled. 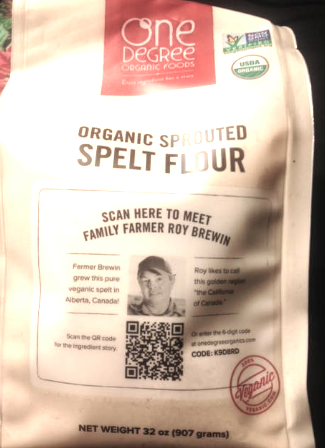 The soil being made inside this tree will be distributed in the garden in October of 2017. On December 1, Loving Garland Green officially ended our first November Leaf Awareness month. Over the last week of November I moved 685 bags of leaves to various places in the garden. About half of the bags have already been opened, and the rest are by the places in the garden where they will be opened and spread. December 1 marked what I thought would be the last of the 685 leaf bags but when Charlie and I came down to the garden last night to check the solar lights on the tree, we saw that a citizen(s) had left thirteen more bags of leaves. This is fine as we have a policy of accepting bags of leaves from the public year-round. Of course we would prefer the leaves are left where they fall as this is the most eco-friendly process; however, that is not always possible in urban areas—thus bringing them to us is preferable to leaving them curbside to go to the Hinton landfill. The soil for all the beds at the Garland Community Garden has been created from leaves, paper, wood, and other decaying organic matter such as raw spoiled vegetable matter. The overwhelming majority of the 685 bags of leaves came from the Firewheel area as I personally picked up 500 of them from that area. I am happy to report that from all the bags I only had to deal with five plastic water bottles, one flowerpot and one beer can. The bags were overwhelmingly filled only with leaves—much of which had already been mulched. Today (December 2) someone dropped off fifteen more bags of leaves making a total thus far of 713 bags of leaves rescued from the landfill. At an average of 30 pounds per bag, this is 21,290 pounds. This may sound like a lot, but unfortunately 713 bags of leaves is tiny when measured against the bags of leaves that are likely taken each year from the homes of Garland residents to the Hinton landfill. Given our approximate 80,000 households and estimating low at five leaf bags per household, we send close to a half million bags of leaves to the landfill each year. 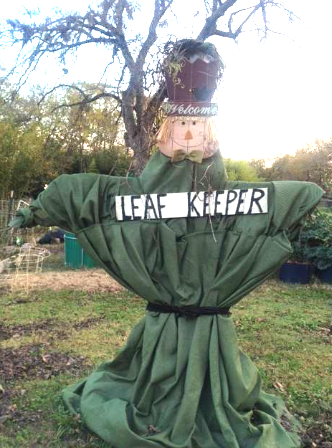 Our Leaf Keeper is merry now—Nothing like 700+ bags of leaves saved from the landfill to make a leaf keeper smile with joy! He will be smiling by the Compost Christmas Tree throughout the month of December. – Garland Community Garden Dec 2, 2016. We invite you to come see him.